We’re talking about social media this month on our Courageous Storytellers membership site (join today! 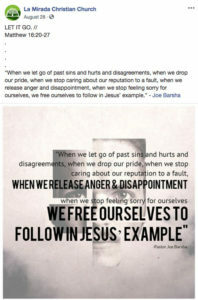 ), so we talked to a few churches about what works best for them. The answers? A lot of video. Four out of the five we talked to mentioned video. Another big win is relevant content, stuff that relates to where people are—whether it’s a sports event or back to school. 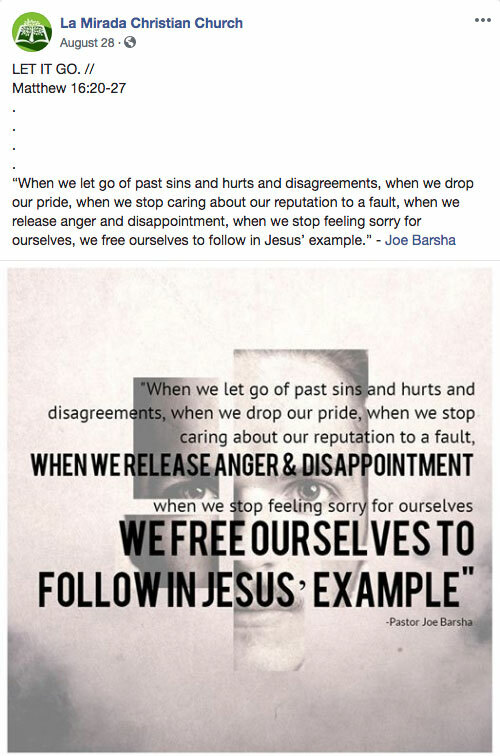 Check out these examples and reflect on what works best for your church. 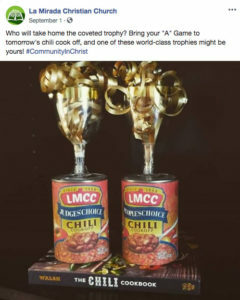 For La Mirada Christian Church in La Mirada, Calif., their live streaming posts get the most views, but they did have a couple recent posts that grabbed some attention. The first is a quote from their NextGen pastor and the second is a promo for their chili cookoff. Sometimes the best worship with Celebration Creative occurs on Wednesday night…Join us Sunday at 9, 10:15 or 11:30. If you can’t make it in person, join us right here for our Facebook Live Service at 10:15. It's here!!! Celebration's first official music video! At Celebration Baptist Church in Tallahassee, Fla., video is where it’s at. The shorter the better. Quick videos of worship rehearsal do well. Their best music video had been the release of an original worship song. 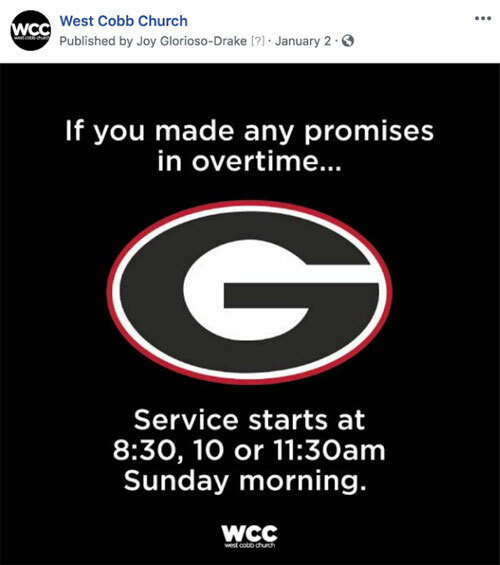 West Cobb Church in Marietta, Ga., found great success playing off sports. 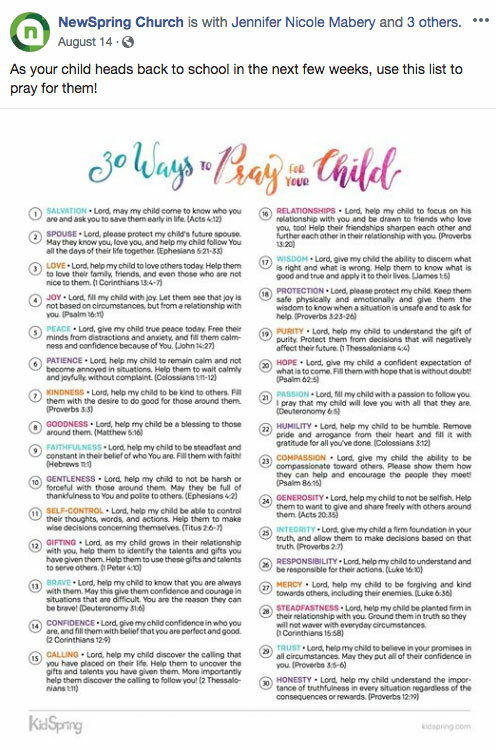 A back-to-school prayer list proved incredibly popular at NewSpring Church in Anderson, S.C. They’ve also had success with Instagram videos like this one. Concord Church in Dallas had a surprise visit from the Prairie View A&M marching band, during the annual Grambling State vs. Prairie View weekend, and so far it’s been their most engaging post. Another popular post was a recap video of their mass wedding event, where they offer free premarital counseling and free weddings to cohabitating couples. If your church needs help getting started with social, check out our free social media starter checklist.